That rough fifth inning could have actually been even worse. The Mets gifted their 14th out of the game to the Twins, as Jeff McNeil ran halfway home from third on a passed ball and then just kinda stood there for a moment. He was thrown out trying to get back to third. But the Twins could not get out of their own way. Jake Odorizzi gave up a single and walked the bases loaded prior to that McNeil baserunning gaffe. Instead of taking advantage of the miscue, Odorizzi re-loaded the bases by walking Mets pitcher Noah Syndergaard. That was it for Odorizzi, as the recently recalled Andrew Vasquez came in to make his 2019 debut for the Twins. It did not go well. Vasquez hit the first batter he faced to force in a run, then walked in two more runs. Trevor Hildenberger came in … he walked in another run. Then he gave up a two-run single. Finally our good ol’ buddy Jeff McNeil came up to hit again and ended the inning by striking out. The Mets managed to scratch across six runs that inning despite recording only two hits, both of them singles. Martin Perez was the next Twins pitcher up. He gave up three more runs over the next two innings. He’s given up 11 hits and walked nine batters in 8 1/3 innings pitched this season. The lineup heated up as soon as Syndergaard was out of the game. They scored four runs in the eighth and Mitch Garver added a solo homer in the ninth. It was an ugly game, but the Twins head home having completed a winning road trip. Another positive: They don’t have to play another road game in a National League stadium until after the All-Star break. This lineup looks like they can score on anyone, but the pitching staff is on balewire right now. Keep running through the 40-man and then some or make a trade or sign Kimbrel. I fear Falvine's inactivity regarding the pitching staff this past winter is going to be difficult to overcome. Yeesh. The bullpen is thinner than my wallet. Gonna be a rollercoaster...I do not think this team can overcome OWNERSHIP INDIFFERENCE.GOSAINTS. Kimbrel never looked so good. I was at this game! Wahoo home opener! Stadium is just as nice as everyone says and seats are right on top of the field even more so than an average minor league venue. Alcala did not look great after the first couple innings and seemed to be working in the lower 90s despite what I've heard about his velocity, and that gift strikeout you refer to was definitely that, but I will say Brian Schales absolutely smoked the ball every time he was up. He's a nonprospect they got from Miami? as far as I know but certainly outshined the rest of the lineup on that particular evening. So, will Odorizzi be able to pitch more than five innings ever again? Bases loaded, you need one out...bring in the callup! Huh? Perez, Odorizzi, Gibson....I guess the Twins really needed to sign a good starter as well as a solid bullpen arm so we can use Parker as a non-closer. Vasquez makes the shuttle ride back to Rochester? Will the snow be removed for ALL seats for Friday's game? 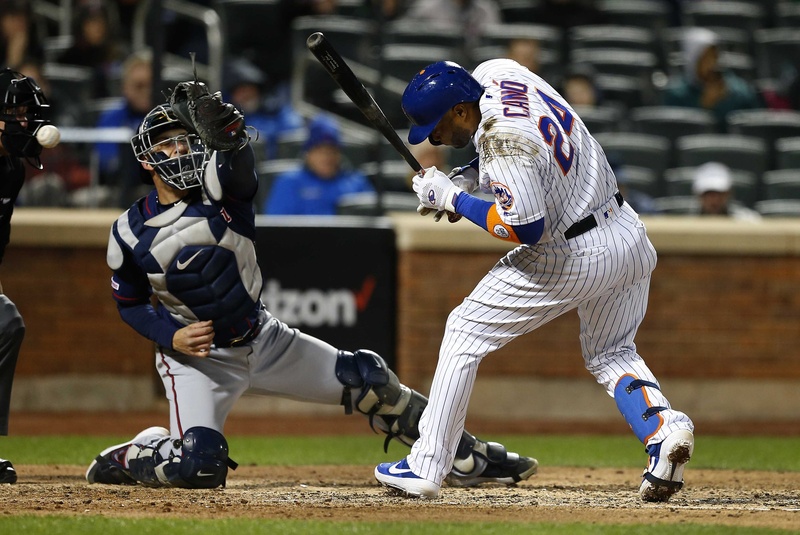 twins 20, mets 17. ten earned runs in 11 innings off two top-shelf starters. a lot to like. It seems mental, to me. Odorizzi pitched a no-hitter through 4, and the 4 pitch walk should have been a K, as all 4 pitches showed to be a strike on pitch f/x. Something is not clicking in his head. The 11 strikeout game he pitched was just as real as the first inning the start in Philly and the 5th inning today. I am not sure what Dilly Dilly was thinking or what metrics drove the decision to put Vasquez in that situation.On top of that, I thought there were signs that Odorizzi was unraveling in the 4th. The decision to let him pitch to the pitcher was a huge mistake. You needed that out.What, because it is not the 7th it isn't a high leverage situation?Bad read, bad metrics or whatever. You gave the game away. Uggh, that was ugly.Sure is interesting how Baldelli is willing to go with the new guy called up that morning in that situation.In the past, Vasquez would have sat in the bullpen for several days before getting used.Unfortunately, he was really bad last night.Don't know what to think about him, or the decision to use him at that point in the game...kind of a head scratcher for me. Morneau mentioned something I had been thinking about.It appeared they were going to pinch hit for Odorizzi in the top of the 5th had he come up to bat.Did that have some mental effect on him when he came back out?Or did they see something in his last inning to question whether or not he was at the end.All in all, puzzling both as to pinch hitting for him and how he went from unhittable to unable to throw a strike. Wasn't all that worried having Moya, Reed and McGill on the IL.Well that has changed.Does anyone know how soon any of these could be back? Definitely chalk that up as a Bullpen loss, maybe someone should keep track? A bit of overreach by Baldelli starting Astudillo for the 5th straight game, then putting in Vazquez before he could return the rental car from Rochester. As long as Buxton plays like he is, Twins are fine. And Garver, and Schoop, and Polanco, and Kepler. One thing Baldelli said was yes he was going to pinch hit for Odorizzi after the fourth, but the pitcher spot didn’t come up. But they could have done a double switch with Schoop and Gonzales leading off the next inning in the pitcher spot. I watched the game. I haven’t been as disappointed in a starting pitcher as last night. There are times in every game, when the game is on the line. 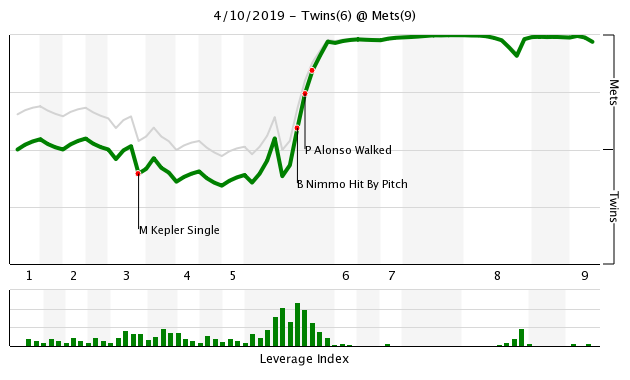 That time last night was when the Mets' pitcher was coming to bat...and again when he was walked, loading the bases. Why not put the best leftyreliever in the AL in to pitch to a left-handed hitted at that critical point...that game changing point? Rogers was well rested and has no game today. Why not put your best reliever in at the game's critical point?